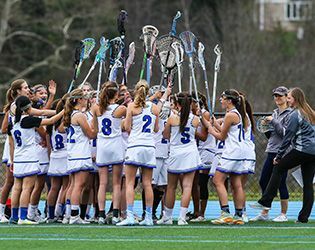 In what promises to be an exciting matchup, varsity girls' lacrosse will face Rutgers Prep this afternoon on the road. Earlier this week, junior Mia Kirby recorded her 100th goal with the team; she is expected to lead the offensive charge in today’s game. On defense, the team will look to junior keeper Katherine Lioudis (260 career saves with Gill) to protect the net. A gallery of girls' lacrosse photos is online now. Stay tuned for additional galleries for our spring teams.